We shall explain why the physics of sailing directly upwind is the same as the physics of sailing directly downwind, faster than the wind. Imagine a sailing craft at the boundary between two fluid masses, as shown in figure 1. Such a situation could arise in various ways, as discussed in section 3. Our craft has a propeller immersed in the blue fluid. The propeller has a relatively fine pitch. To a zeroth approximation, it serves to lock the craft to the blue fluid. The craft also has a turbine immersed in the red fluid. The turbine has a relatively coarse pitch, which means the fluid can flow through it relatively easily. Figure 1 analyzes the situation using a reference frame comoving with the blue fluid. This is symbolized by the balloon, which is at rest with respect to the blue fluid. In this frame, we can understand that the turbine is turning, because of all the air flowing through it. It doesn’t turn very fast, because of the coarse pitch, but it turns at a decent steady rate. The turbine drives the propeller. 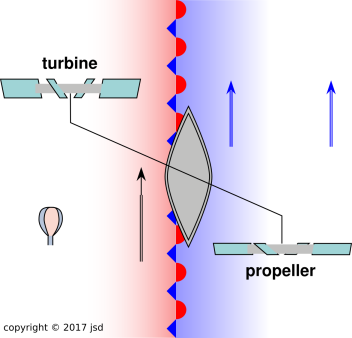 The coarse pitch of the turbine gives it mechanical advantage, so it overpowers the propeller, not the other way around. So the propeller turns a little bit, driving the craft forward a little bit relative to the blue fluid, as indicated by the black arrow. In the chosen frame, the blue fluid doesn’t count as wind at all; it is just a bunch of stationary fluid. The only thing that counts as wind is the red fluid, and the craft is moving directly upwind against this wind. Next, let’s analyze the exact same physics using a different reference frame. In accordance with Galileo’s principle of relativity, the observable behavior will be exactly the same ... just described in different words. This time we choose a reference frame comoving with the red fluid, as symbolized by the balloon in figure 2. Once again, the propeller is immersed in the blue fluid, and to a zeroth approximation serves to lock the craft to the blue fluid. In our reference frame, the red fluid does not count as wind; it is just a stationary mass of fluid. The blue fluid is the only thing that counts as wind. So to a zeroth approximation, the craft is just drifting downwind. However, as it drifts, a great deal of fluid is flowing through the turbine. This drives the turbine a little bit, which in turn drives the propeller a little bit, so the craft moves downwind slightly faster than the wind. Perhaps both fluids are air, for instance at a stationary front, as suggested by the red-and-blue symbols in the diagram. Even in the absence of a weather front, there is less wind near the surface than there is higher up, due to surface friction. An albatross can stay aloft for a very long time by maneuvering in such a way as to extract energy from this difference in wind velocities. Perhaps both fluids are water, for instance at the boundary of the Gulf Stream. We could replace one of the fluids with a solid roadway, and replace the turbine or propeller with wheels. Mechanical advantage is critical here. Without it, the turbine would not turn the right way, and upwind sailing would not be possible. See also reference 1. 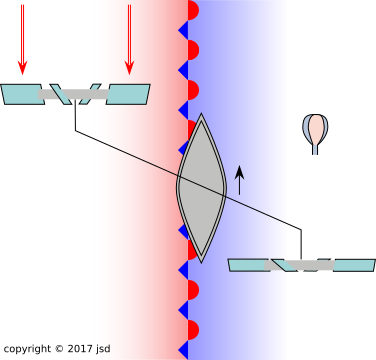 The same concept is critical to understanding how a jet engine, and in particular why it rotates the right way, as discussed in reference 2. Bottom line: If you can sail directly upwind, you can sail directly downwind faster than the wind. The principle of relativity guarantees it.